Watch more anime and stay frosty~! Today we’re bringing back our interview column, “Hi, I’m…“! Recently turned 29-years-old and based in Canada (which surprisingly not many people know), Tristan (or Arkada) has been an anime YouTuber for over 8+ years, and has seen his fair share of how the anime YouTube world has evolved. Although at times he may feel like his videos are not as uniform as he would like them to be, he is still the content creator & owner of Glass Reflection, one of the highest Anime channels on YouTube (over 540,000+ subscribers). I had a lovely Q & A with Tristan about his life as a YouTuber, what it’s like dealing with imposter syndrome, and what he would have done if YouTube didn’t pan out for him. Please enjoy~! No video is exactly the same. While there are many things about the videos I make that are kind of like repeating the same actions over and over, the order of these actions largely are different from video to video. Hence, Uncoordinated. How did you come up with your channel’s name? I can’t remember the exact story, but it had something to do with trying to be smarter than I actually was. Like reflecting on things I watched through glass, as I was using CRT monitors and televisions to watch anime at the time. I thought I was being really cool. In retrospect, I should have perhaps done something different, but I just wanted to avoid calling my channel or videos “Arkada’s Anime Reviews” or similar because that was an overused style at the time. Speaking of Arkada, is that part of your actual name or a username/nickname? It’s the name that I’ve been using as a web alias for… a very long time. I’ve had others during my younger years like I assume most people have, but this was the one I started using full-time back in mid-high school and never saw a reason to discard. What is your overall goal for your channel? To educate and inform. To showcase the various options of anime that people have available to them and, hopefully, to get people to watch more of it. Is that why you say at the end of your videos, “Watch more anime”? It’s why I’ve started to say that, yes, just to drive the point home even further and to also constantly remind myself why it is I do what I do and what my end goal generally is. Because sometimes you forget after editing non-stop for 15+ hours. What got you into creating anime/animation based videos? Back in 2009, I kept seeing video reviewers and content creators making videos on topics other than anime and just thought to myself: “I could do that.” So I went about making videos. What do you do besides make videos? I ONLY MAKE VIDEOS. I ONLY WATCH ANIME. THESE ARE THE ONLY THINGS I AM ALLOWED TO DO. In all seriousness, I spend a decent amount of time playing video games, reading novels, and just mindlessly roaming the wastes of the internet. I have multiple. At the studio, I have my filming setup and my desk. The filming space is rather cramped, as I have a series of lights and equipment all surrounding a single space in the room that I stand in when I record. My desk is much more open, as it’s in a larger room that I share with a few other YouTubers. There’s enough space on it for some select memorabilia and I’ve added a glass case on the wall above my desk for a decent chunk of my Nendoroid collection. I know you’re an avid fan of Nendoroid. What was the first one that started the collection and which is your favorite? The first one that started the collection was a Nendo of Hajime Ichinose from Gatchaman Crowds. I bought her because me and my fiancé had recently bought our first car and named it after that character, since it was a series we jointly liked and the translation of the name (Beginnings) was appropriate for our first foray into owning a vehicle. Less than a week after buying the car I took a road trip to Youmacon in Detroit, where in the dealers’ hall I found the Nendoroid for $20. Bought it on the spot, ordered a stand, and now it sits in my car on the dash in front of the passenger seat. My favorite is the one I think I don’t actually own yet. I preordered a Nendo for the character of Rin from Laid-Back Camp. She has a DX version Nendo that comes with a tent and a bunch of fun extras that I’m looking forward to displaying on my shelf at work. What software/hardware do you use? There is almost too much hardware to list, but mostly I use a Nikon D5300 with various lenses, and either a Rode Microphone for studio shots or an Audio-Technica condenser microphone for videos where I’m not on camera all that much. Software is a bit easier as I mostly stick to the Adobe Creative Cloud. I don’t have a typical day honestly. I have several different kinds of days. Some days are Writing days, where I spend hours agonizing over a script, usually for several days in a row. I have Filming days where I constantly repeat that script in front of a camera until I’m happy with the take. And Editing days, where I wake up early, go to bed late, and somehow finish a video in time for an arbitrary deadline I set that I inevitably fail at because technical difficulties happen to me constantly and drain both my time and will to live XD. What is one thing that people don’t know about you? Honestly, I feel like not enough people know that I’m Canadian. I get that reaction quite often even 10 years since I started. Though honestly, despite saying it every week via Twitter, I’m constantly surprised by the number of people who don’t know that I stream on Twitch on a weekly basis. Really though, it’s my own fault. I don’t advertise the stream, by design, on either my YouTube or on my Twitter (with exception to saying that I’m going live) so unless you both follow me on Twitter and happen to look at your feed every Tuesday at 6 PM Eastern Standard Time you’d never know. Still, it’s funny to see people walk into the chat and comment on how they never knew I streamed! Who are three people in your line of work that influence you? Define “in my line of work”! I have several other YouTubers I look up to and who I admire their work. 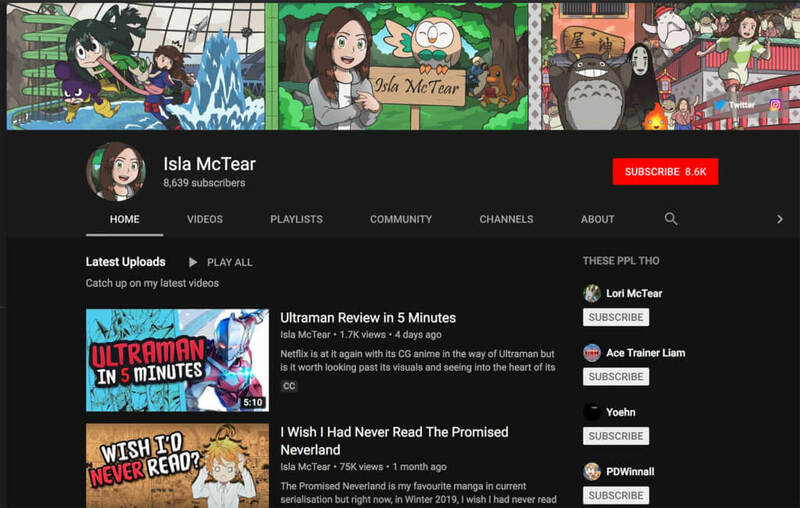 In the realm of anime, I have far too many people that I think are worth mentioning, so I’ll just drop one here and say, my friend, Isla (IslaMcTear on YouTube), makes videos that are well worth the watch. Outside of YouTube but staying within the realms of anime, I’d have to mention the work of Kevin Penkin, who was the composer for Made in Abyss. Not only have I had the pleasure of meeting with and spending time with him as a person, but his work has inspired me to do better with my own projects, even if I don’t think very highly of my own work. Lastly, and this is probably stretching the “In your line of work” requirement of the question, but the cast and crew of Critical Role are absolutely fantastic human beings. They are both voice actors for many of the pieces of entertainment that we enjoy, video games and anime, and just fabulous content creators in their own right. What is something you struggle with when working on your channel (promoting, editing, etc) and how do you overcome it? Sometimes I find the tedium of what I do exhausting. There are times when editing a video that I can get very into the moment and invest in what I’m doing. But there are plenty of times where the attitude I have is “Yep, doing this same exact thing again.” It’s unavoidable that it would happen with videos that by necessity have to contain some similar things every time, but that doesn’t make it easier to do every week. As far as promoting goes… I just don’t all that much. As I mentioned earlier I’m not one to think extremely highly of my own work by and large, so I always feel like what I have to offer isn’t always worth promoting to a larger audience. Do you ever deal with imposter syndrome? If so, do you have any advice? Ain’t this a mood. Imposter syndrome is my bread and butter. It’s what I sweeten my coffee with every morning and what keeps me awake at night. Honestly, I don’t have any good advice as to how to combat it. If you do I’d love to hear it! Really how I’ve learned to cope with it presently is just to find distractions outside what is causing it at the moment. If my channel and my videos are causing me anxiety I move on and try to immerse myself in a video game or a book, or a long-form series on YouTube or Twitch, just something to get my mind off of it, if only for a moment. It probably isn’t the best or most optimal way to cope with it. Trying to ignore the problem can’t honestly be the best way to handle the problem, but it’s kept me going so far. If you didn’t become a YouTube content creator, what were your plans? This is a hard question to answer, mostly because I never really had plans at the time in my life that most people have plans. I started making videos at the start of university, after getting into a “New Media” program. I didn’t learn all that much there that helped my video making but if the YouTube thing didn’t play out the way that it did I couldn’t tell you where I would have ended up. “New Media” as it was described to me in Uni is… well, everything. It ties into so many things that I had classes on editing, programming, filmmaking, robotics, and so many things in between. Heck, I had several classes that took place within an artificial program called Second Life just because we could. I’d like to hope that if I wasn’t making anime videos though that I would still be just as big of a fan of anime as I am now. Even if my outlet for it would be something different entirely. Do you have any goals you’re wanting to strive for? That’s all for this interview! Arkada has a Patreon if you wish to support him on a monthly basis! You can find Tristan on Twitter! 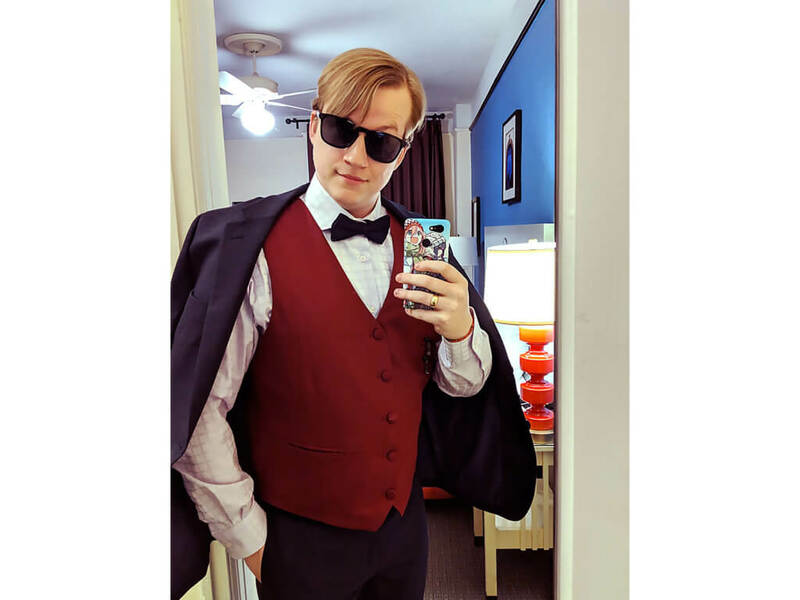 Be sure to subscribe to his YouTube channel and Twitch Channel (which he streams on every Tuesday 6 PM EST)! Editor Note: This interview was edited slightly for clarity. In the “Hi, I’m…” series, we sit down with fantastic folks who influence the world of Japanese culture, from AniTubers to experts & industry celebs. Every other month, we’ll present a new interview with insight on their daily life, their thoughts on the Japanese Culture industry and tips for those wanting to debut in the same field as them. Have someone you want to see featured or questions you think we should ask? Send us an email: YattaTachi[at]gmail.com.